Japan’s Toyama Prefecture, Governor Takakazu Ishhi and his 19 member delegation arrived in Vijayawada on a two-day visit to Amaravati. The delegation has signed several MoU's with Andhra Government. And the Japanese deligation tour in Amaravati, also have turned culinary side. The Japenese delegation went to breakfast in Gateway Hotel, Vijayawada. 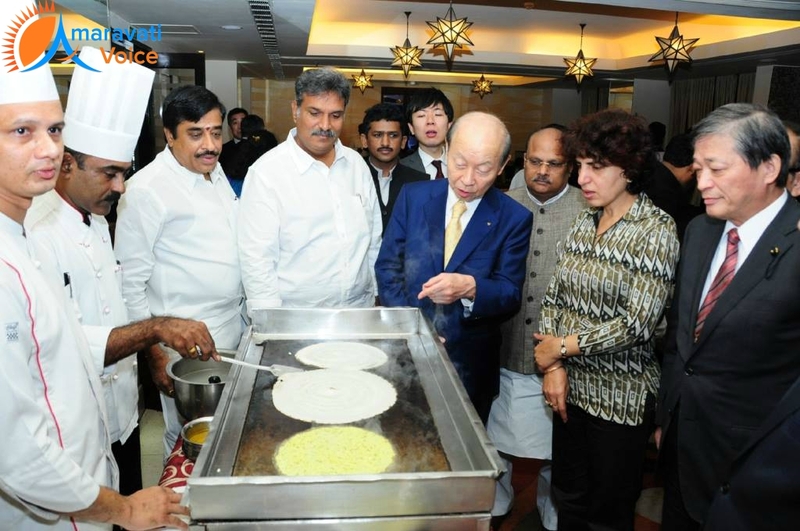 They are served with traditional Andhra dishes Idli, Upma, Vada, Dosa etc.. Out of all these, the crispy dosa has attracted Japanese Governor. Governor Takakazu Ishhi and his team, not only ate the dosa with relish, they also went into the kitchen to see how the dosa is made and enquired about its ingredients.